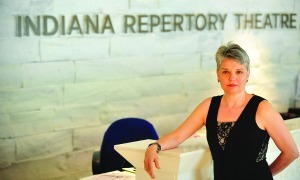 Janet Allen has worked at the IRT since 1980 (with a three-year break in the mid-eighties), first as dramaturg, then as associate artistic director, and, since 1996, as artistic director. In the current IRT program book, she talks about her career development and about the IRT. Here in this online extra, she talks about other, earlier experiences. Can you remember the first play you saw as a child? The first theatre experience I remember was in Chicago when I was probably 8 or 9 maybe, so this was mid-sixties. My dad had a friend who was directing a community theatre or semi-professional production of Carousel in Chicago, in Old Town. I remember we were sitting on the aisle, and the actor playing Billy Bigelow came down this aisle, singing, and every hair on my body stood up! I remember nothing else about the production. What I remember is that we were invited to the director’s house. He lived in Marina Towers, and he had a living room with all windows, a red wall, and a giant black grand piano. The company stood around that piano and played songs, and my brother and I crawled under the piano and listened to them sing. It is a very pungent memory to me, although it had absolutely nothing to do with career choice at that time. So you weren’t yet bitten by the theatre bug? I took piano lessons, and sang in church choirs, and sang around the house a lot. My mother was a dancer—a very accomplished high school and college ballet dancer—and so she hauled us to dance class. But that was kind of all there was. I didn’t even know as a kid to yearn for an outlet of theatre. I didn’t know enough about it. I was a cheerleader in the sixth and seventh grades, and I remember being taken to a road show of Mame, I think, as a consolation for not making eighth grade cheerleading. This was way before I had any interest in theatre career-wise. I followed my older sister into cheerleading in high school. This was the seventies, before Title 9, so there were no female competitive sports. Cheerleading was a sport for me. But I found it extremely … arid as a mental pursuit, and I decided to try out for a play. It was Oliver!, and I was cast as Nancy. I was a pretty OK singer. My cheerleading buddies were scandalized that I would go hang out with the theatre freaks. But of course, the theatre folks were also scandalized that somebody who had spent no time in the trenches was cast in the big lead. I was in a bunch of musical theatre things, but we also did Shakespeare from time to time. We did Shakespeare in state Thespian competitions, a 45-minute Macbeth. I played a witch, and I discovered I preferred that to the musical comedy stuff. We were one of the top Thespian teams in the state of Illinois because our theatre director was on a very big upward trajectory of ambition. We were competitive machines. Some of that I found not good at all, but I learned a lot. One of the things I learned was that acting was not going to capture my attention, personally, so I started to do some other things. I stage managed a little bit. I worked in the booth a number of times. I wasn’t particularly interested in pounding nails, so I wasn’t suited to that. I knew that I wanted to go to college in theatre, but I didn’t have any idea what its application would be. I didn’t really understand yet what directing was. I hadn’t watched enough of it to understand how much of it was pedagogy, and how much of it was an art form. Later on, when I was in graduate school at IU, they wanted all of us to act, so I did a little acting, quite begrudgingly. And you know, in retrospect, I’m glad that I had a quasi-adult experience as an actor. I remember a bunch of that work, and its travails, which really has built in me a huge respect for actors—how beautiful their discipline is. I’m not that disciplined, so I could never do that. Talk about your experiences with the famous Steppenwolf Theatre gang from Chicago. When I was in high school, doing Thespian competitions, our biggest rivals were Highland Park High School and Homewood/Flosmoor High School, which is where some of the original Steppenwolf-ites were. I met a bunch of those guys in high school, competing against them. So when we met again in college, at Illinois State, we could put the dots together backwards. I roomed with a number of people; among them was Laurie Metcalf, now of Steppenwolf provenance. And at that time her boyfriend was John Malkovich. And part of that time, one of my guy pals was Jeff Perry [one of the original four founders of Steppenwolf]. So it was a social/theatre swirl, of course. Gary Sinese was only in college with us for about five minutes. Some people never finished; some people did. That was the big thing: whose parents were going to make them finish college, and how many of them could just leave and go to work making this wild theatre company. It was ’76. And Steppenwolf already existed; it was this little company that these guys had started in high school, and then they decided they really wanted to pursue it professionally. At that time the theatre scene in Chicago was starting to foment. And so a bunch of people quit college, or graduated, and went to Chicago, and started Steppenwolf as a working entity in Hull House, when I was a junior. I sat in a lot of discussions about making this theatre company. But I knew that it was not for me, because I was much more interested at that point in the pedagogy side. I wanted to learn more, basically. I didn't think I knew anywhere near enough to start doing. Later, when I was in graduate school, I would visit them and see their work, and think, this is so cool what you’re doing, but it’s still not for me. And part of that was, they were leaving school to defy pedagogy, and I wanted to get deeper into the pedagogy. The sheer muscular power of the kind of plays they wanted to do was astounding, and in many ways still is. But the range of the pedagogy, particularly as it related to classic methods and texts, was still hugely fascinating to me. I loved graduate school, because I could specialize in theatre history, dramatic literature, drama theory, and that stuff was just like opening a universe to me.